Internal Folding Doors - Multifold 2-6 Doors - Direct Doors UK – Tagged "primed-bi-folding-doors"
We can supply you with the very best Internal folding doors and multi folding doors up to 6 doors wide at low prices in a range of flush, panelled or glazed internal folding door styles. Find our Internal BiFold Doors here. We supply and deliver the vast majority of our folding doors within 4 - 5 working days to most post code areas in the UK with our free delivery service but some suppliers do take up to a 7 working days, delivery of the frames, doors and fittings may be from two specialist suppliers. All our folding doors have safety glass as standard and qualify for our free UK wide delivery service......... virtually anywhere within the mainland UK! If you need a more bespoke size or configuration have a look at our Bespoke Folding Doors. All Thrufold door products are cut to size upon receipt of order and cannot be cancelled afterwards, they are classed as a bespoke item created and manufactured by DirectDoors.com to suit your exact folding door dimensions. 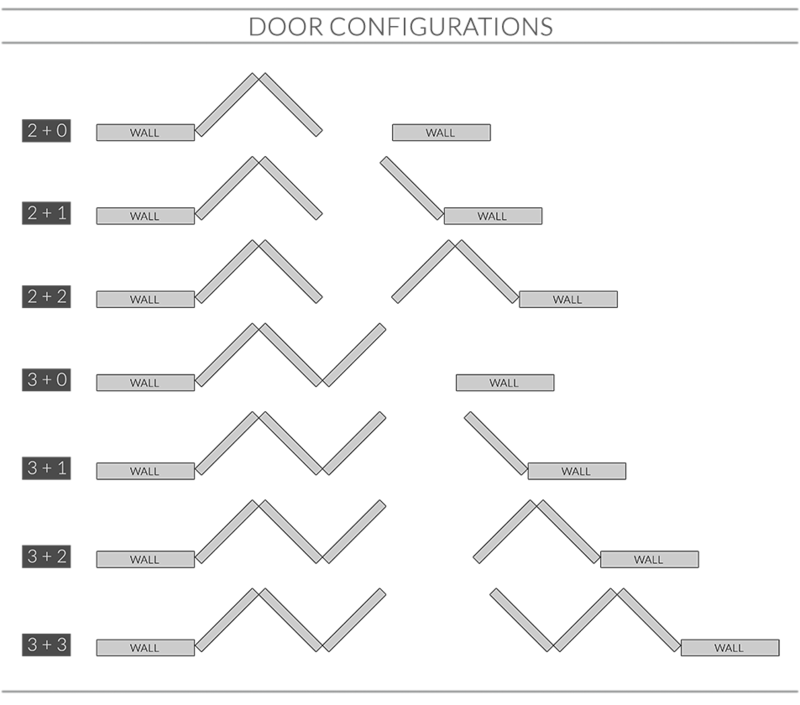 A large range but broken down in to three easy to navigate categories, we have then added simple filters to allow you to see the chosen configuration, door style and finish that best suit you and your home. Please be aware that each image or PDF's for our internal folding doors show a position of a flush pull, hinges, slip bolt etc but the position of each item is very dependent on how you and your carpenter decide the doors should open. There will be occasions when you may decide that the flush pull is better fitted in the centre of the middle door for a 3 door set or indeed a latch handle is fitted on the main opening door, you may also decide that you do not want to fit the slip bolt - each and every decision is yours to make - just decide before fitting any of the above items. The small door stops (25x12mm) for some of the configurations will have to be "offset" so one leg allows the main door to close against it in a traditional manner whereas the same door stop will be fitted on the opposite side at the other frame leg. 2+0, two doors opening left or right. 2+1, two doors on one side and one opposite. 3+0, three doors opening left or right. 2+2, two doors opening to each side. 3+1, three doors on one side and one on the opposite. 3+2, three doors opening to one side and the other two opening to the opposite side. 3+3, three doors opening to each side. The door types are flush, panelled or glazed in a range of real wood veneers, we also offer white or colours such as grey painted and lastly laminates, oak folding doors whether fully prefinished or not have unfinished oak veneered frames while all other folding doors such as walnut, painted colours or white have white primed frames...... prefinished relates to the actual door - not the frame material. Our Thrufold frames use three main individual door widths which are 686mm, 762mm and 838mm, when you combine these sizes with all the configurations you have 21 folding door widths from 1445mm all the way through to 5115mm wide, massive choice but easy to search and choose. All Thrufold MDF frame items are supplied in kit form with full track and fittings but without screws or nail fixings, they are not assembled, glass is pre-installed in the doors where there are glass apertures. Walnut doors are supplied with white primed frame and associated material, walnut veneered frames are not available but we could supply unfinished oak frames at an extra cost to allow you to stain them. Unfinished and prefinished oak veneer doors are supplied with unfinished oak veneer frames and associated material. White primed, white painted or coloured doors (Grey/Ivory/Laminates etc) are supplied with white primed frames and associated material. Please be prepared to locally source readily available screw fixings for the systems. Any mention of prefinished, pre-finishing or fully varnished refers to the door alone. Please note that we may use narrower doors for some sizes of this product whether panelled or glazed, they may have narrower panels or glass than the image shown, this is because the timber sections that make up the doors construction remain the same size across the full range of door sizes. ThruFold doors can open towards or away from you, you set the hinges accordingly during installation to suit your own requirements, flexibility is key with this range, the use of up to as many as 6 folding doors for those larger openings is almost unique in the UK, the variables include different veneers, glass types and panel types. There is a huge range of painted folding doors, walnut folding doors, white folding doors or oak folding doors with panels and / or glass, with so many of our individual products having both Oak and White primed folding door options available within those products we know that it will take you time to browse. In the setting up of this category we have tried to break the range down to manageable browsing chunks to make the selection easier and allow you to quickly source just what you require at truly affordable prices. All our bi folding doors are veneered on solid cores to provide the best finish and a solid door that will last as long as you, all our glass is toughened safety glass and will provide safety for children and adults alike. We have the expertise to help guide you through what could be deemed a minefield of information or we can provide the help you may need to decide whether to adjust existing door styles or consider a bespoke manufacture of a door style from our range to meet your needs, please don’t hesitate to contact us for advice on any internal bifold doors and what alterations would best suit you. A fantastic range of folding doors, most of which can be adjusted, please read each doors individual instructions. Where we state that these folding doors are supplied in "Kit Form" we can assure you that the glass or panels are always fitted and that they are hinged together to form a Bi fold doors pair, just to reiterate, the glass is always toughened safety glass without exception. Help tips on choosing Double doors or Folding doors. We like you to feel comfortable and reassured you are buying the correct product, please read the content in the PDF's above before placing any orders.